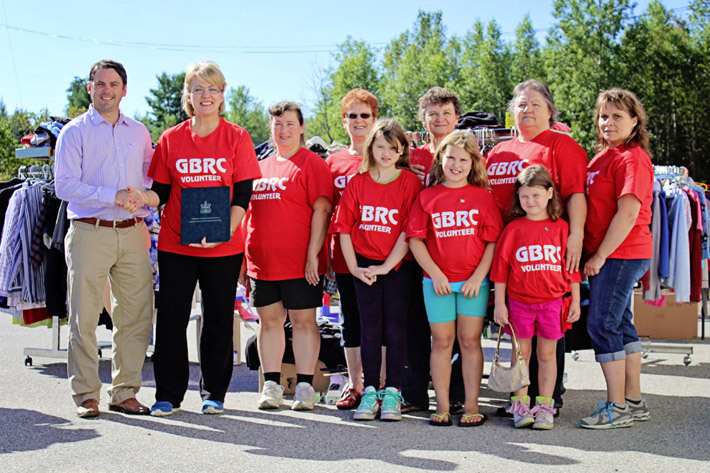 The Greater Blackville Resource Centre has received a grant in the amount of $1,960 from the Department of Healthy and Inclusive Communities. These funds are in support of the centre’s community-driven project to increase access to healthy food, enhance food skills, and strengthen their community capacity. Southwest Miramichi MLA Jake Stewart presented the Community Food Action Program Grant to Greater Blackville Resource Centre President and Founder Pastor Albertine LeBlanc on Saturday, August 24 at the centre’s fundraising yard sale. Also in attendance were volunteers Joy Underhill, Penny Siddall, Lorraine Underhill, Darlene Jardine, Secretary/Treasurer Stacy Underhill, Deanna Nordin, Amy Walls and Miranda Nordin. This Grant Program contributes to the implementation of the New Brunswick Wellness Strategy, which works to improve mental fitness and resilience, increase physical activity levels, healthy eating and tobacco-free living.